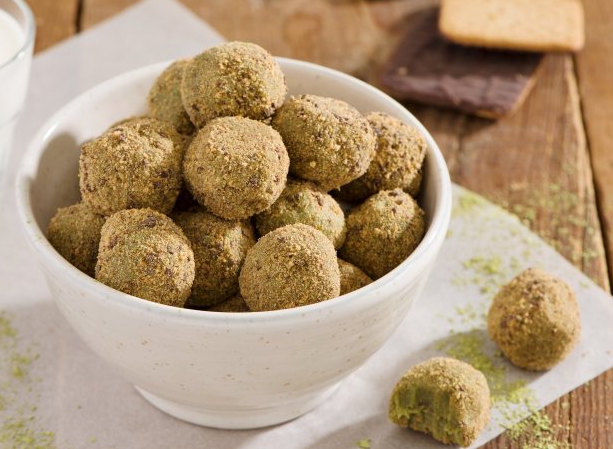 Addictively delicious, these homemade truffles are made with a simple white chocolate ganache and crushed Schar Gluten Free Chocolate Honeygrams. Place chocolate in small heatproof bowl; set aside. Bring cream to a simmer in small saucepan over medium-high heat, stirring frequently. Pour over chocolate. Let stand for 5 minutes; stir until smooth. Whisk in butter until melted and well combined. Stir in matcha. Let stand until room temperature. Fold in 1/2 cup crushed Schär Gluten Free Chocolate Honeygrams. Chill until set. Scoop with teaspoon and roll into 1-inch balls. Roll balls in remaining crushed Schär Gluten Free Chocolate Honeygrams to coat. Place in mini muffin paper cups.